Your opinion matters. Leave A Review Or Edit This Listing for Saint James Episcopal Church Food Pantry. Hours: 12:30 - 4 pm on Thursdays. Now serve 450-500 families weekly. More than 70 volunteers help each week and receive lunch. 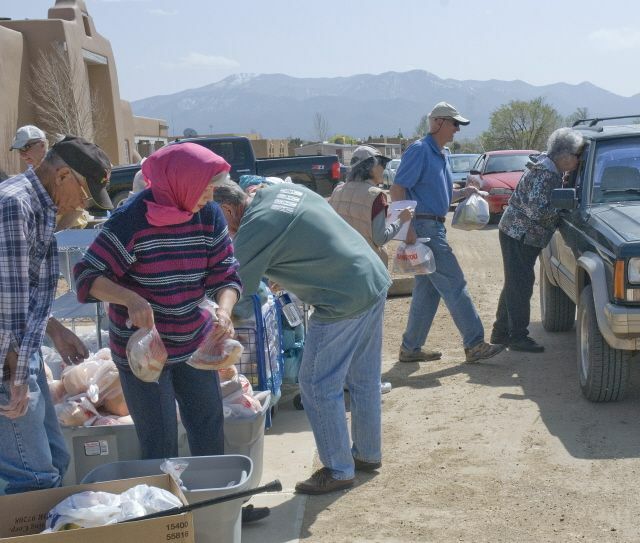 The St. James Food Pantry helps meet the needs of the Taos community by dispensing bags of food staples. We typically give more than 600 bags each week; each bag contains a selection of items that may include beans, rice, oatmeal, cans of food, and fresh produce. We always need more information on our pantries. If you know of any details, volunteer information, website, hours or more description information about Saint James Episcopal Church Food Pantry please add a comment (below the map on this page), with information. We will then display this for all visitors on this page.